Hotel Centre Superior, Prague. Centre Superior Hotel Prague. The Prague Centre Superior is a late 20th century building known to be one of the area's national architectural treasures. Situated in a prominent position, close to the places of interest and local transport network, guests are able to travel freely around the centre and admire this charming European destination. 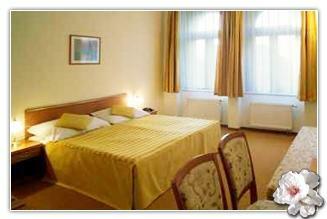 All rooms are en-suite with all modern comforts such as satellite TV, hairdryer, safety deposit box and telephone line. For those looking to hold a small conference or special event, the purposely built meeting room with a capacity of 25 people and the latest technology is available to hire. Should guests simply choose to stay at the hotel and relax in their rooms, in the charming garden or have a relaxing massage the friendly staff are on hand to help or meet the needs of even the smallest requests. Parking is available at the hotel, ensuring guests that their car will be kept in secure and safe surroundings, whilst visiting the sights or attending business meeting in and around the city.